Would you like to elicit up to 40% more information from your witness interviews? Learn how to save time and money through thorough and effective cognitive interviewing techniques. Interviewing witnesses can be difﬁcult. Whether you are interviewing children, trying to manage a difﬁcult witness, or taking a statement over the telephone, getting sufﬁciently useful and accurate information from a witness can be a challenging task. Unlocking Memories: Cognitive Interviewing for Lawyers offers proven techniques that can help you to build and develop a rapport with your witness, assess credibility more accurately, and elicit up to 40 per cent more reliable information for your case. Geoff Coughlin has provided interviewing training to thousands of litigators, including to those involved in both the Bloody Sunday and the Shipman Inquiries. 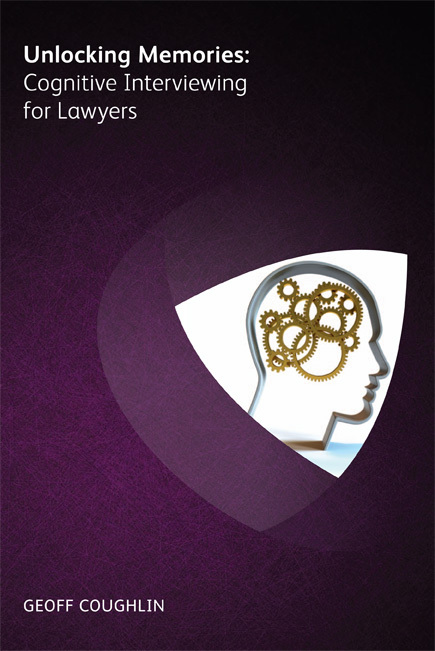 In this book, the ﬁrst practical guide to helping lawyers master the cognitive interview approach, he draws upon his signiﬁcant experience to explain why the techniques are so effective, and he provides a step-by-step framework to apply them. “It is one thing to understand that something works; it is an entirely separate matter to work out why. I had discovered that special interviewing techniques were needed when I embarked on investigating allegations of abuse in children’s homes in Wales for a broadcaster client in the mid 1990’s. As a seasoned commercial litigator, the usual question and answer technique was unlikely to encourage damaged children to tell me about their terrible experiences of being abused whilst in care, in some cases a long time before. Through experience, I found that there was a better way of encouraging the witnesses to talk, and to give their evidence in a way that was satisfactory to them. This meant that I would often have to meet with prospective witnesses in locations of their choosing, and spend a lot of time listening (not a customary skill of a litigator), and responding. Trust was built slowly. Interviews could be lengthy, and would be dictated by the witness’ pace. But the outcome could often be stunning, with evidence of a quality and reliability that I had not predicted at the outset. When my team and I were appointed as Solicitors to the Bloody Sunday Inquiry in 1998 to investigate traumatic events that occurred in 1972, and where a public inquiry at the time had failed to engender public confidence, I was clear that every member of my team would need to be skilled in the art of cognitive interviewing- a technique of which I had experience in practice, but without a deeper understanding of the philosophies and concepts that underpinned the process. It was at that stage that with the assistance of the authors of this book, I sought out a more vigorous analysis of the reasons for the success of the techniques, and ensured that all team members used them, to ensure uniformity of approach. They were trained accordingly. The result was the conduct of over 2000 interviews using a consistent approach to obtain a consistent body of quality evidence. Lawyers for many of those who gave evidence openly stated that the evidence was of a very high quality, and that the methodology- inherently inquisitorial in its nature- had proved particularly suitable to engender confidence in the process and to dispel pre-existing scepticism. The benefits have endured and my team still adheres to this methodology in public inquiry work up until the present time.